I wish to sum up my basic philosophy in addressing my messages to the Natural Solutions Foundation, constant source of moral support for my activities. 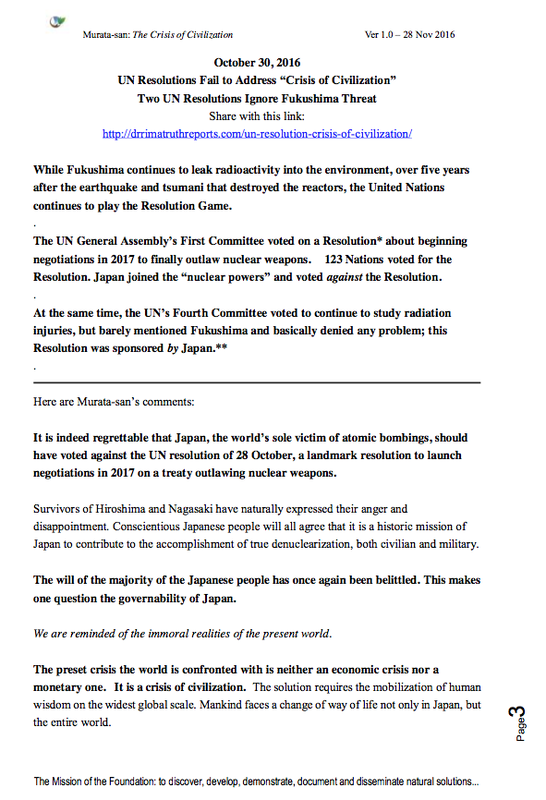 Conscientious Japanese people will all agree that it is a historic mission of Japan to contribute to the accomplishment of true denuclearization, both civilian and military. I am reminded of the immoral realities of the present world. It is against fundamental ethics to abuse and exhaust natural resources that belong to future generations and leave behind permanently poisonous nuclear waste and enormous financial debts. It is a matter of great urgency to put an end to this civilization based on greed. year by year, to reflect on the importance of ethics. The will of heavens and the earth (the law of history) tells us that immorality cannot last long. 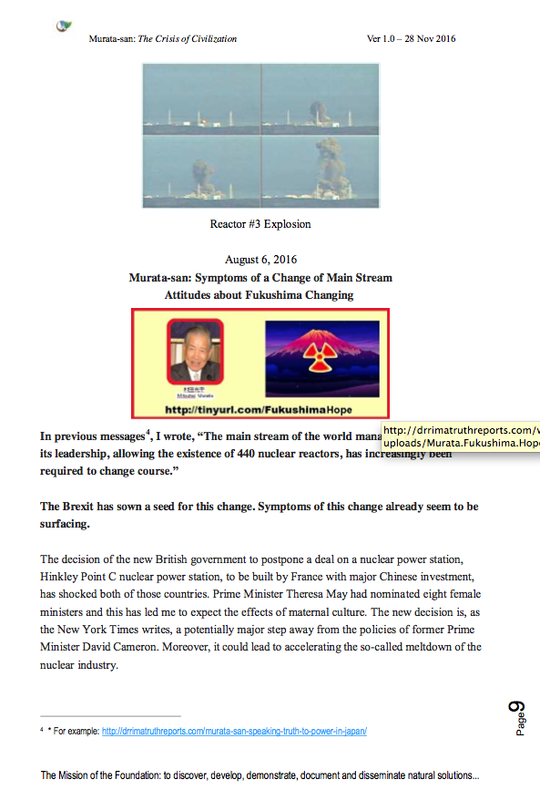 The main stream of the world that tolerates the existence of 440 nuclear reactors has started to change in recent months. The election of the new American president Donald Trump will certainly bring about its deepening. ￼￼￼￼Hon. 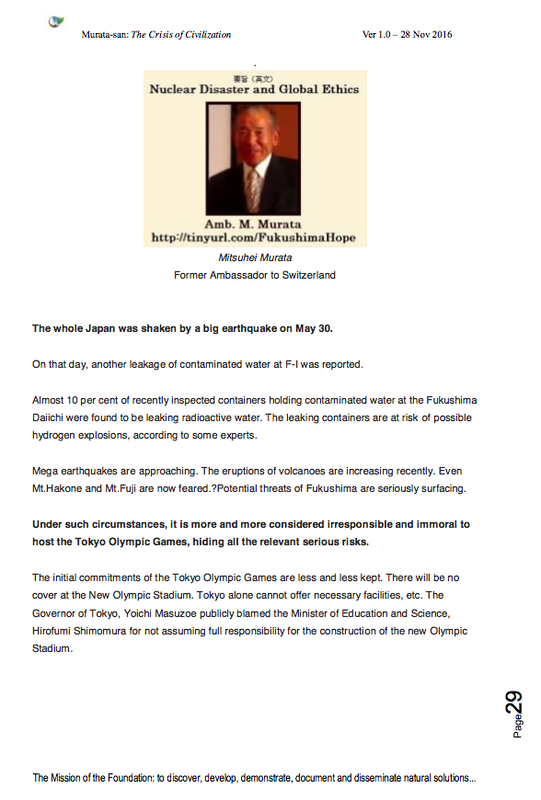 Mitsuhei Murata is the former Japanese ambassador to Switzerland who has become known as the “Conscience of Fukushima” for speaking out on the ethical issues involved in the continuing crisis at the Fukushima, Japan nuclear reactor complex, destroyed on March 11, 2011, by a combination of earthquake, tsunami and explosion. 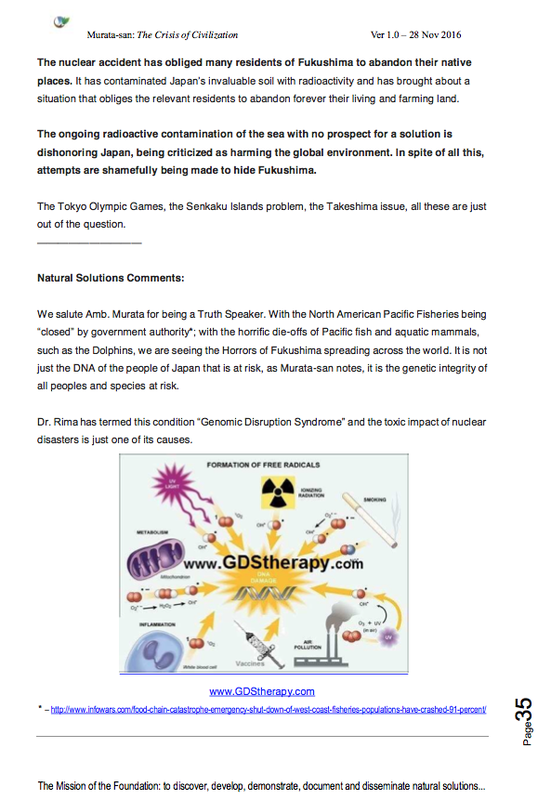 Murata-san has provided the Natural Solutions Foundation Health Freedom Blog with a series of powerful reports from Japan since the tragedy. This ebook brings some of those essay reports together as The Crisis of Civilization. The reports are presented in chronological order, most recent first. ￼￼￼While Fukushima continues to leak radioactivity into the environment, over five years after the earthquake and tsumani that destroyed the reactors, the United Nations continues to play the Resolution Game. ￼negotiations in 2017 to finally outlaw nuclear weapons. 123 Nations voted for the Resolution. Japan joined the “nuclear powers” and voted against the Resolution. ￼Survivors of Hiroshima and Nagasaki have naturally expressed their anger and disappointment. Conscientious Japanese people will all agree that it is a historic mission of Japan to contribute to the accomplishment of true denuclearization, both civilian and military. ￼The will of the majority of the Japanese people has once again been belittled. This makes one question the governability of Japan. ￼We are reminded of the immoral realities of the present world. ￼The preset crisis the world is confronted with is neither an economic crisis nor a monetary one. It is a crisis of civilization. The solution requires the mobilization of human wisdom on the widest global scale. Mankind faces a change of way of life not only in Japan, but the entire world. ￼debts. It is a matter of great urgency to put an end to this civilization based on greed. ￼Now is the time for us to transform it into a civilization based on “maternal culture” that gives the supreme value to life, and not to economy as heretofore. It can be defined as a maternal civilization based on ethics and solidarity that respects the environment and the interests of future generations. ￼Under such circumstances, it is badly needed to hold a United Nations Ethics Summit as early as possible and to create an “International Day for Global Ethics” that will enable all nations, year by year, to reflect on the importance of ethics. ￼The will of heavens and the earth (the law of history) tells us that immorality cannot last long. The main stream of the world has started to change. 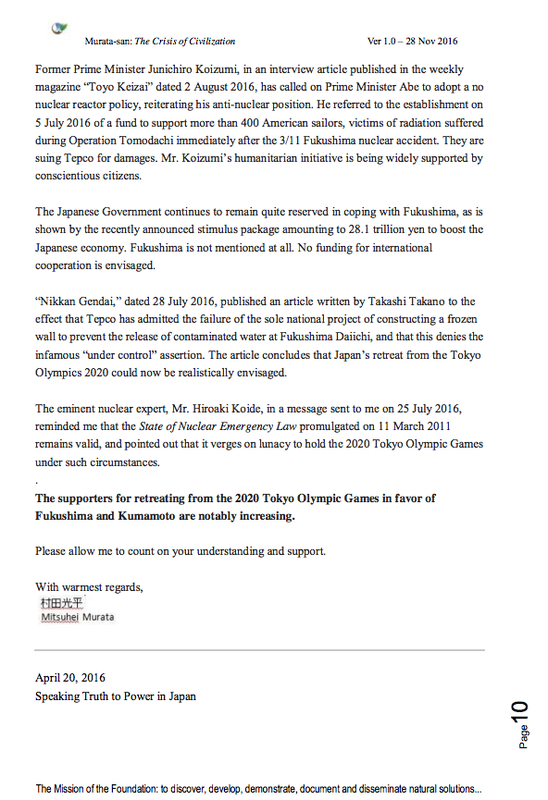 ￼It is to be deplored that the departure from the spirit of the Olympic Games is attaining its limitations due to its excessive commercialization more and more disclosed recently in connection with Governor Yuriko Koike’s new initiative to reduce the Olympic expenditure. 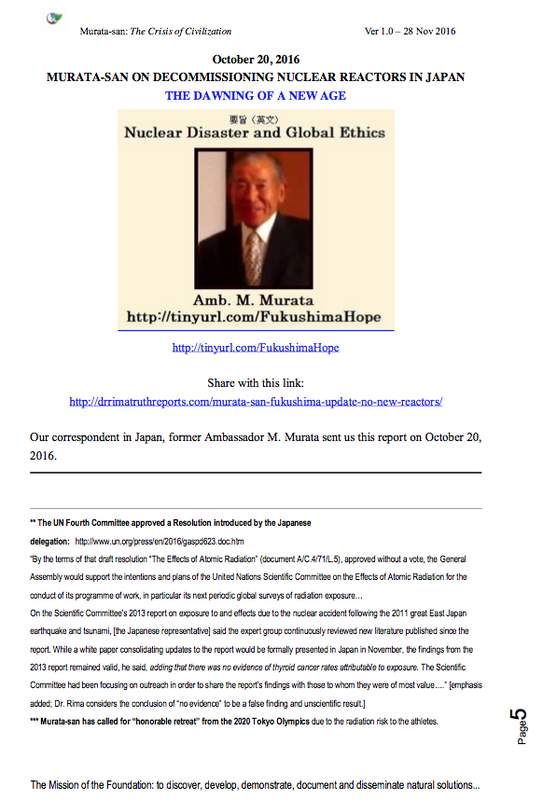 ￼￼￼Our correspondent in Japan, former Ambassador M. Murata sent us this report on October 20, 2016. ￼view of the influence it will no doubt exert globally, it is no exaggeration to say that it will give rise to the beginning of the end of nuclear reactors. ￼The restart is unthinkable hereafter. 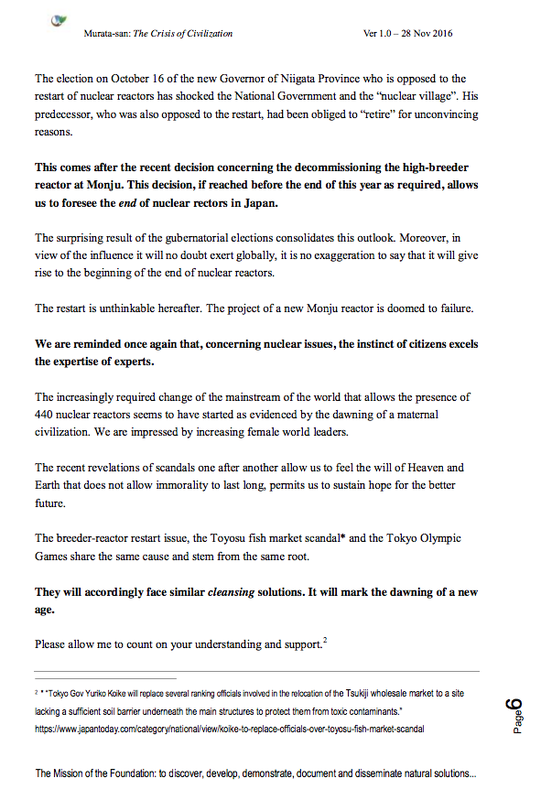 The project of a new Monju reactor is doomed to failure. ￼440 nuclear reactors seems to have started as evidenced by the dawning of a maternal civilization. We are impressed by increasing female world leaders. 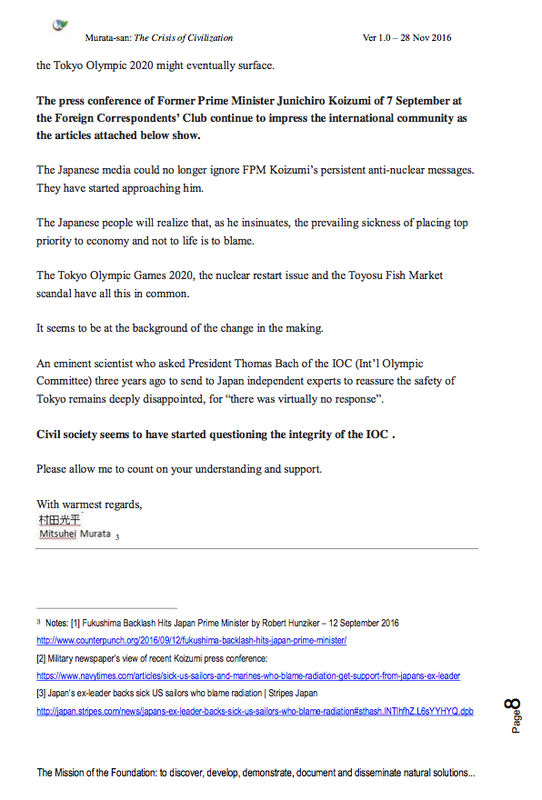 Irregularities concerning the Toyosu Fish Market have shocked the Japanese public. Soil replacement work to address contamination was omitted under some key facilities of the market! ￼last long is currently clearly visible. Symptoms of an important change are increasing. ￼Murata-san: The Crisis of Civilization Ver 1.0 – 28 Nov 2016 the Tokyo Olympic 2020 might eventually surface. 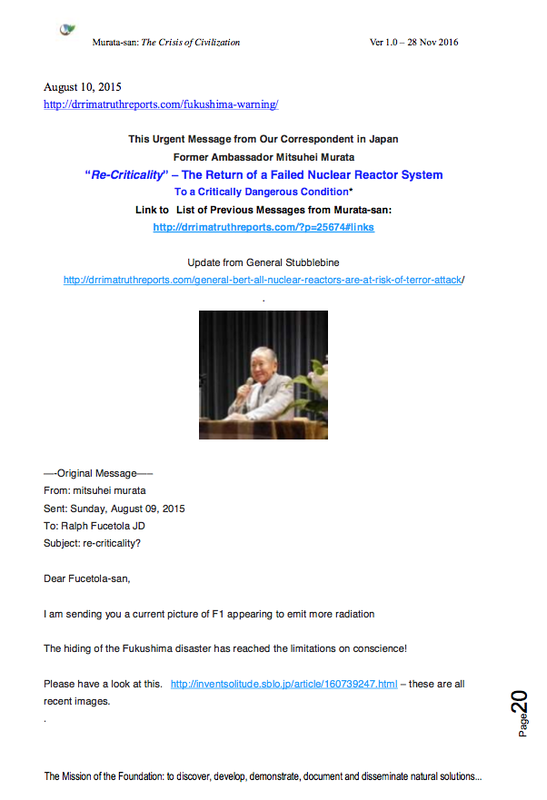 The Japanese media could no longer ignore FPM Koizumi’s persistent anti-nuclear messages. They have started approaching him. The Japanese people will realize that, as he insinuates, the prevailing sickness of placing top priority to economy and not to life is to blame. 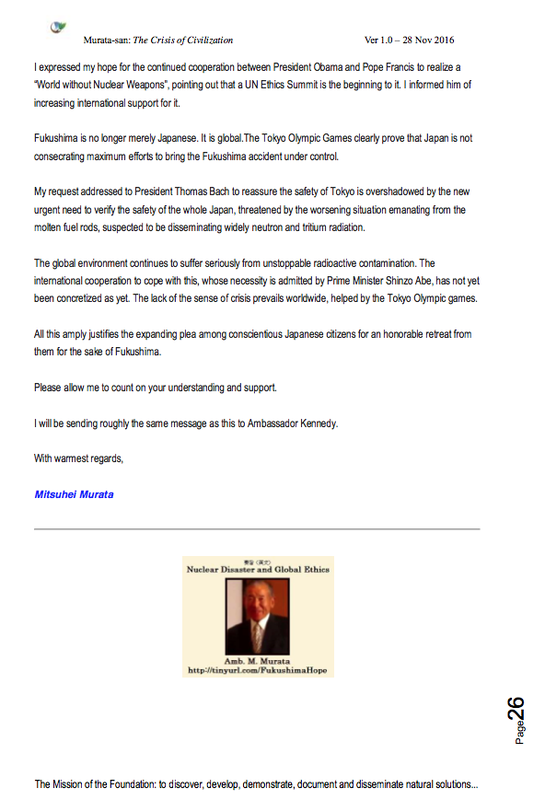 An eminent scientist who asked President Thomas Bach of the IOC (Int’l Olympic Committee) three years ago to send to Japan independent experts to reassure the safety of Tokyo remains deeply disappointed, for “there was virtually no response”. ￼the articles attached below show. The Brexit has sown a seed for this change. Symptoms of this change already seem to be surfacing. 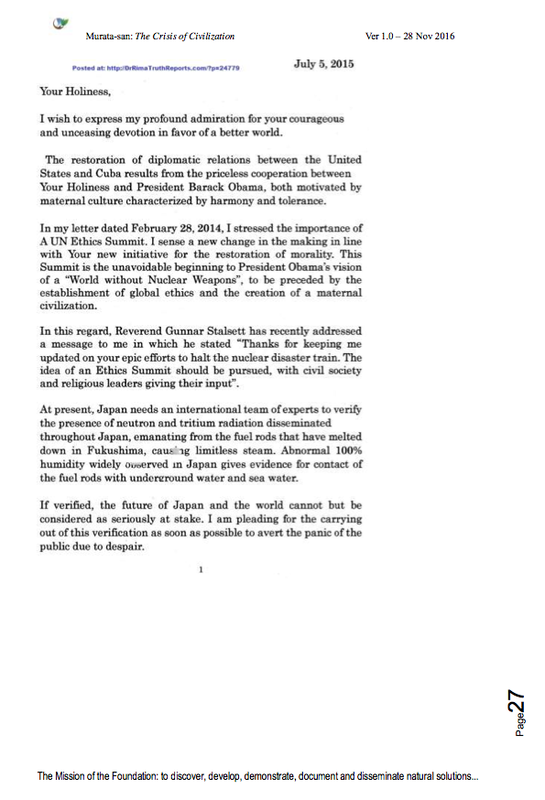 Former Prime Minister Junichiro Koizumi, in an interview article published in the weekly magazine “Toyo Keizai” dated 2 August 2016, has called on Prime Minister Abe to adopt a no nuclear reactor policy, reiterating his anti-nuclear position. 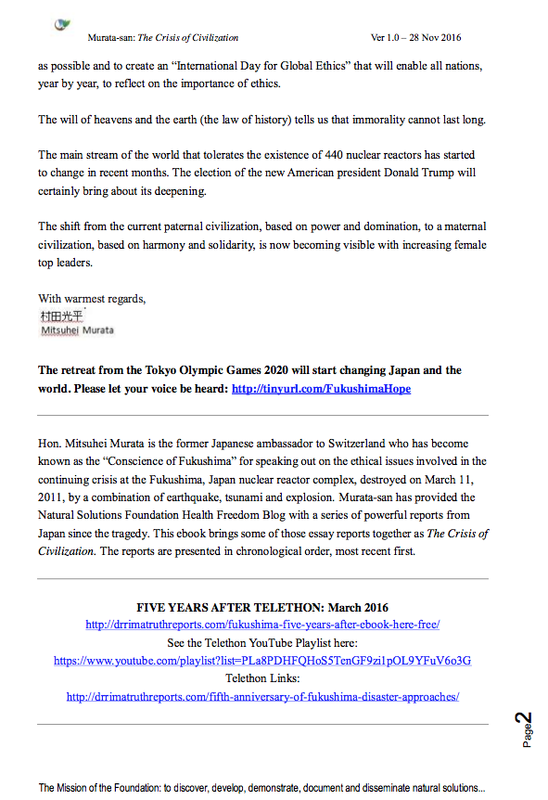 He referred to the establishment on 5 July 2016 of a fund to support more than 400 American sailors, victims of radiation suffered during Operation Tomodachi immediately after the 3/11 Fukushima nuclear accident. They are suing Tepco for damages. 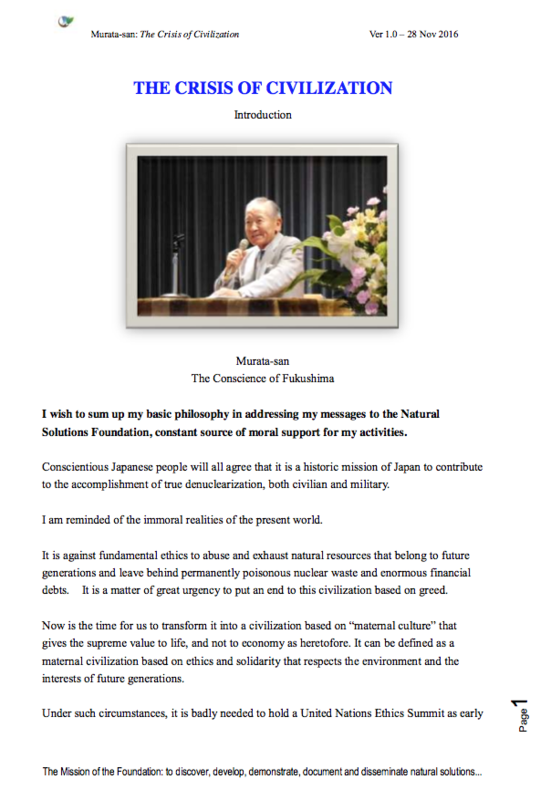 Mr. Koizumi’s humanitarian initiative is being widely supported by conscientious citizens. “Nikkan Gendai,” dated 28 July 2016, published an article written by Takashi Takano to the effect that Tepco has admitted the failure of the sole national project of constructing a frozen wall to prevent the release of contaminated water at Fukushima Daiichi, and that this denies the infamous “under control” assertion. 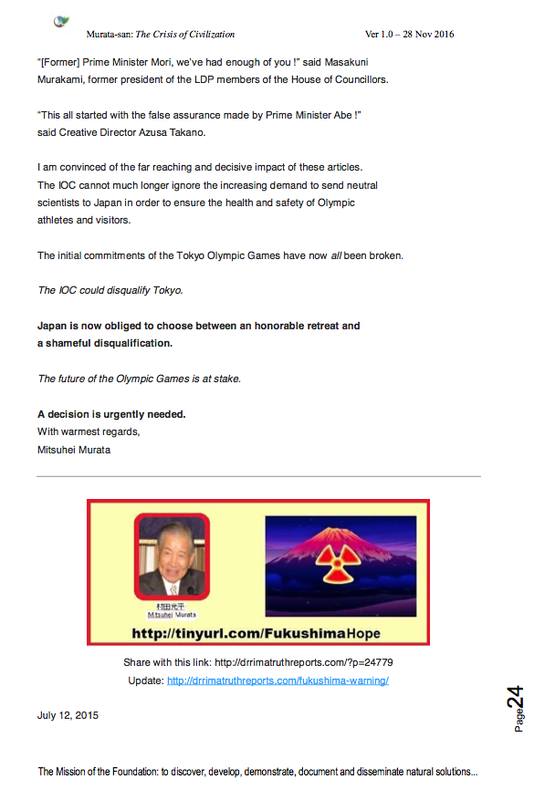 The article concludes that Japan’s retreat from the Tokyo Olympics 2020 could now be realistically envisaged. 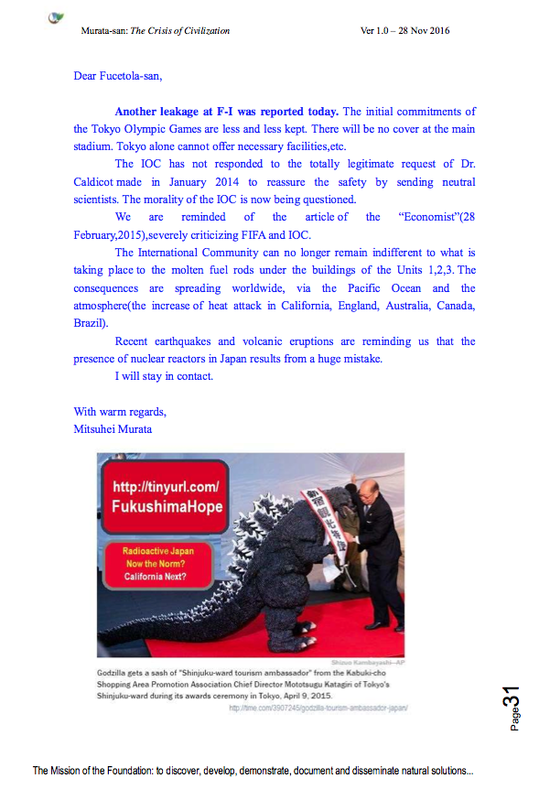 ￼increased level of birth defects in parts of Japan near the stricken nuclear power plants at Fukushima make Amb. Murata’s plea all the more urgent. Prime Minister Shinzo Abe, informing him of the contents of the telephone call. 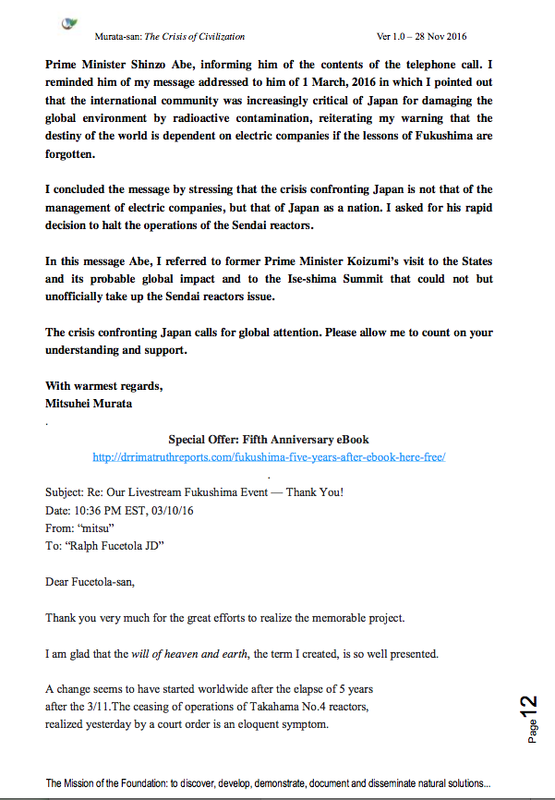 I reminded him of my message addressed to him of 1 March, 2016 in which I pointed out that the international community was increasingly critical of Japan for damaging the global environment by radioactive contamination, reiterating my warning that the destiny of the world is dependent on electric companies if the lessons of Fukushima are forgotten. ￼Thank you very much for the great efforts to realize the memorable project. A change seems to have started worldwide after the elapse of 5 years after the 3/11.The ceasing of operations of Takahama No.4 reactors, realized yesterday by a court order is an eloquent symptom. 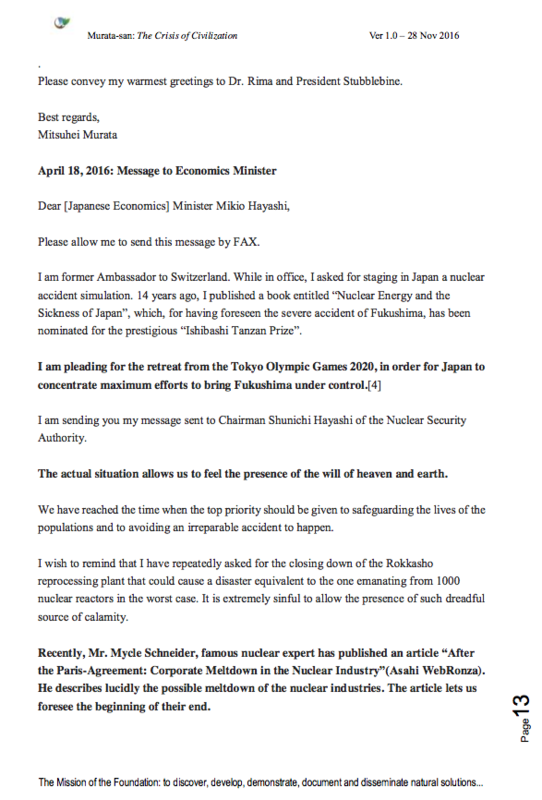 Dear [Japanese Economics] Minister Mikio Hayashi, Please allow me to send this message by FAX. ￼Sickness of Japan”, which, for having foreseen the severe accident of Fukushima, has been nominated for the prestigious “Ishibashi Tanzan Prize”. 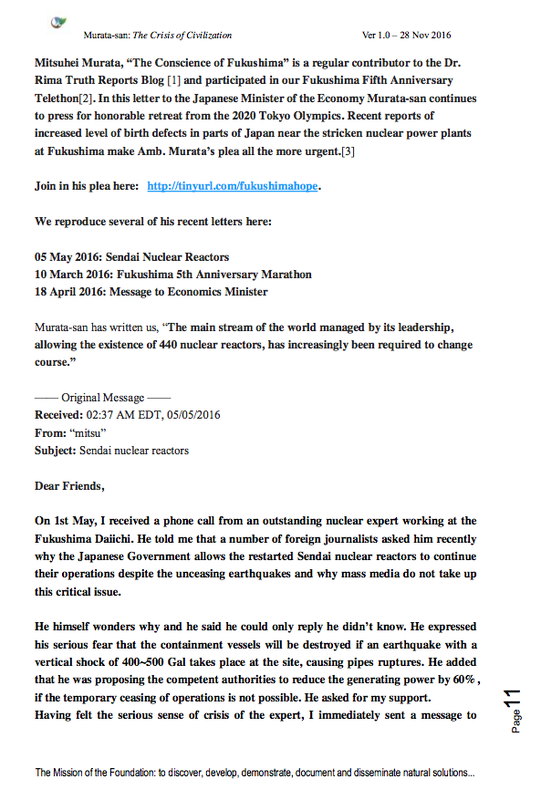 ￼I am sending you my message sent to Chairman Shunichi Hayashi of the Nuclear Security Authority. ￼We have reached the time when the top priority should be given to safeguarding the lives of the populations and to avoiding an irreparable accident to happen. ￼On the other hand, Dr. Andreas Nidecker, former Director of the IPPNW (International Physicians for the Prevention of Nuclear Wars. Laureate of Nobel Peace Prize 1985. 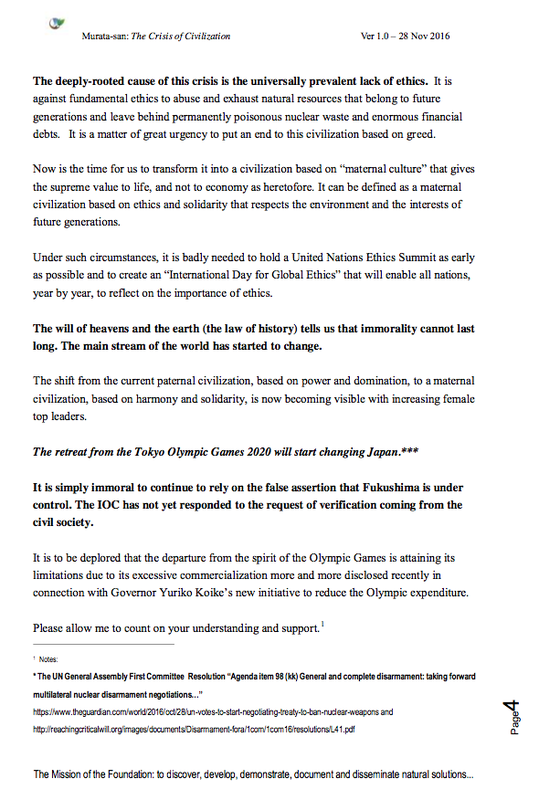 200 thousand members from 83 countries) has sent the attached letter to Former Prime Minister Naoto Kan, proposing the postponement of the Tokyo Olympic Games until 2024 or 2028. ￼The International Community has started taking concrete steps on this matter. Please allow me to ask for your leadership and your contribution. . 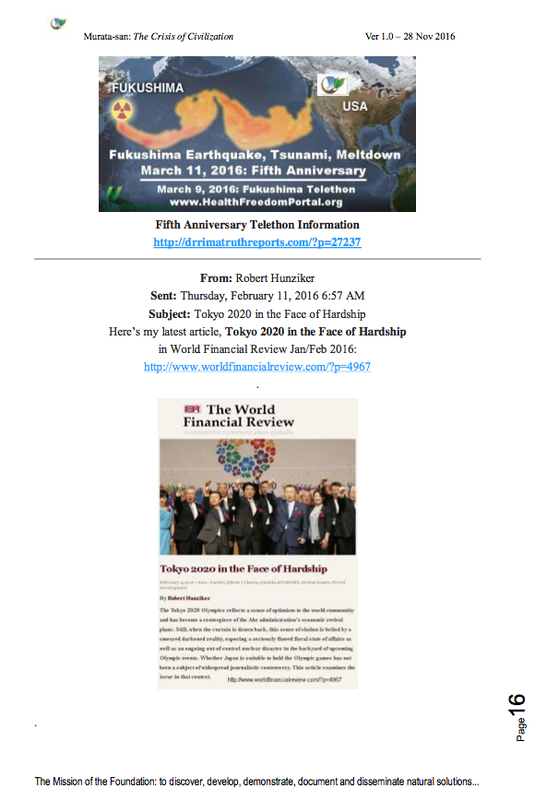 I am sending you the attached article of Mr.Robert Hunziker. It is most enlightening and convincing. 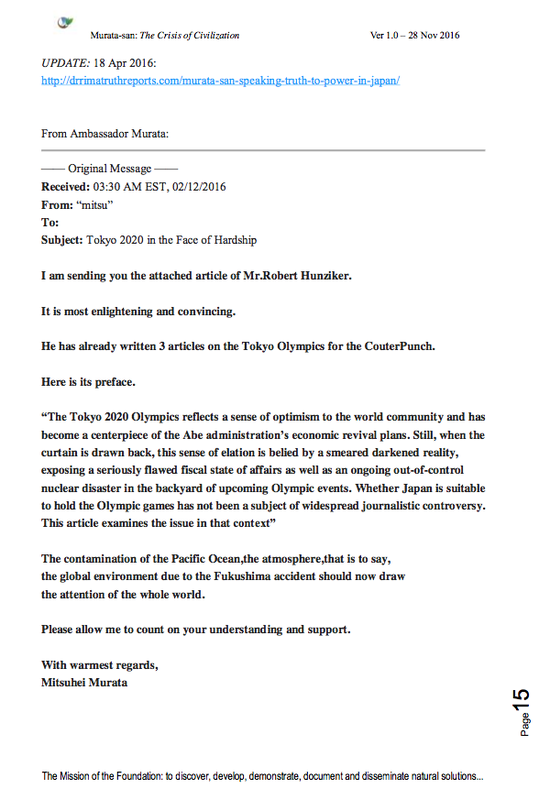 He has already written 3 articles on the Tokyo Olympics for the CouterPunch. Here is its preface. 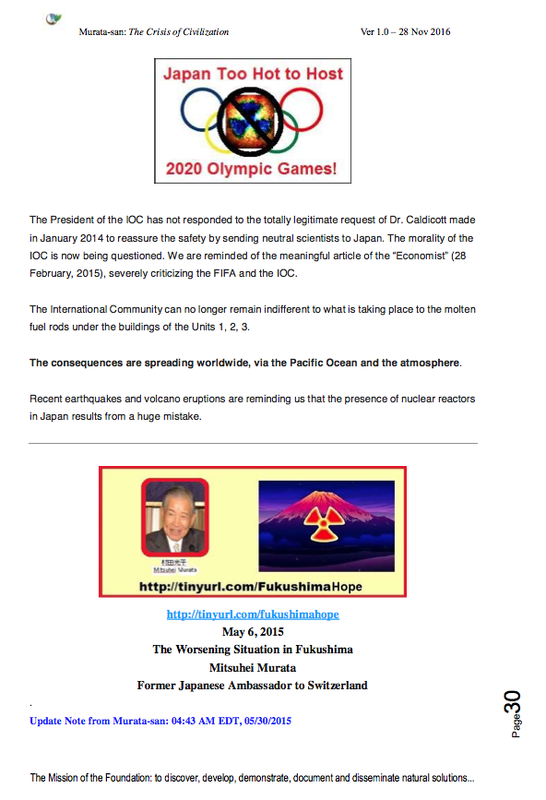 The contamination of the Pacific Ocean,the atmosphere,that is to say, the global environment due to the Fukushima accident should now draw the attention of the whole world. 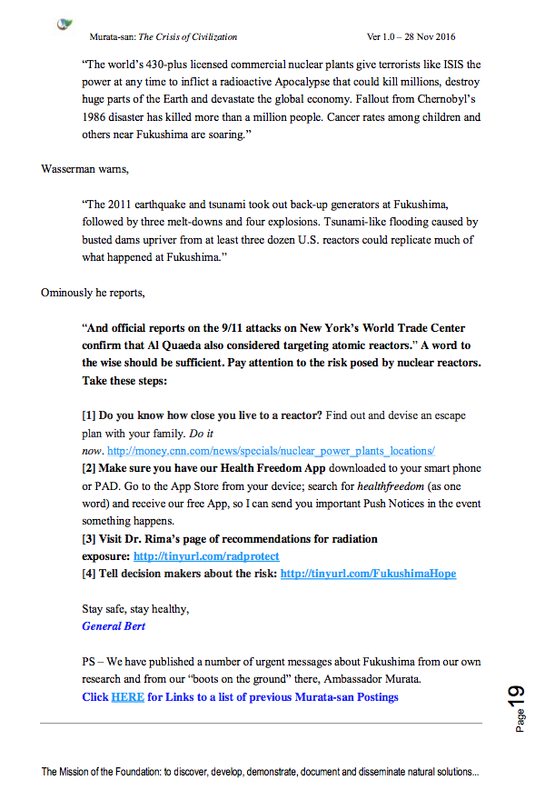 ￼I am transmitting this urgent information from Mr. Harvey Wasserman, a most famous American anti-nuclear journalist. 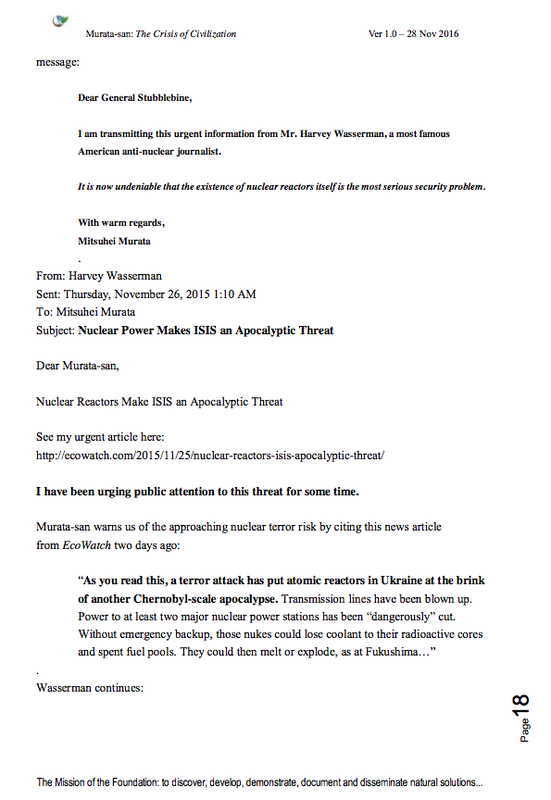 It is now undeniable that the existence of nuclear reactors itself is the most serious security problem. I have been urging public attention to this threat for some time. ￼“As you read this, a terror attack has put atomic reactors in Ukraine at the brink of another Chernobyl-scale apocalypse. Transmission lines have been blown up. ￼￼word) and receive our free App, so I can send you important Push Notices in the event something happens. 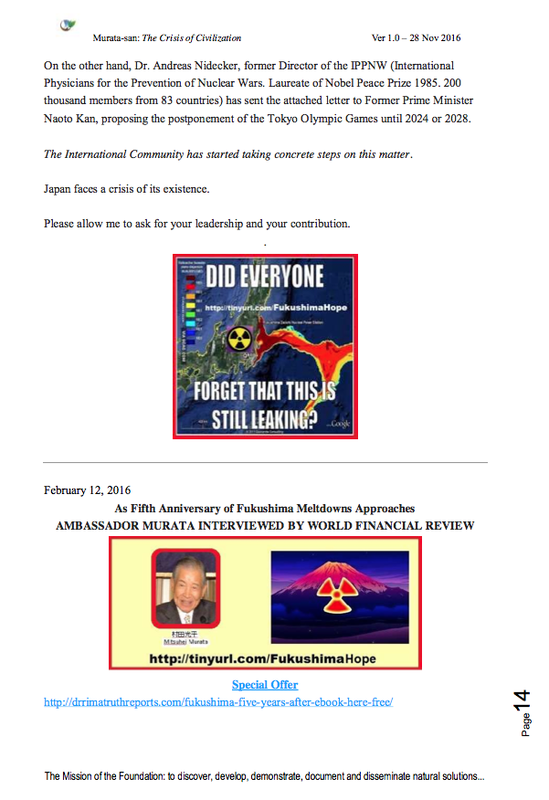 PS – We have published a number of urgent messages about Fukushima from our own research and from our “boots on the ground” there, Ambassador Murata. 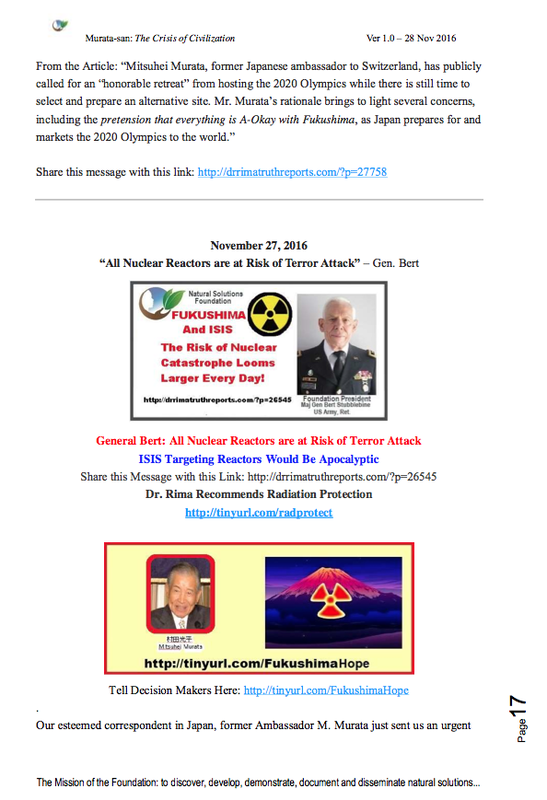 ￼￼Update from General Stubblebine http://drrimatruthreports.com/general-bert-all-nuclear-reactors-are-at-risk-of-terror-attack/ . 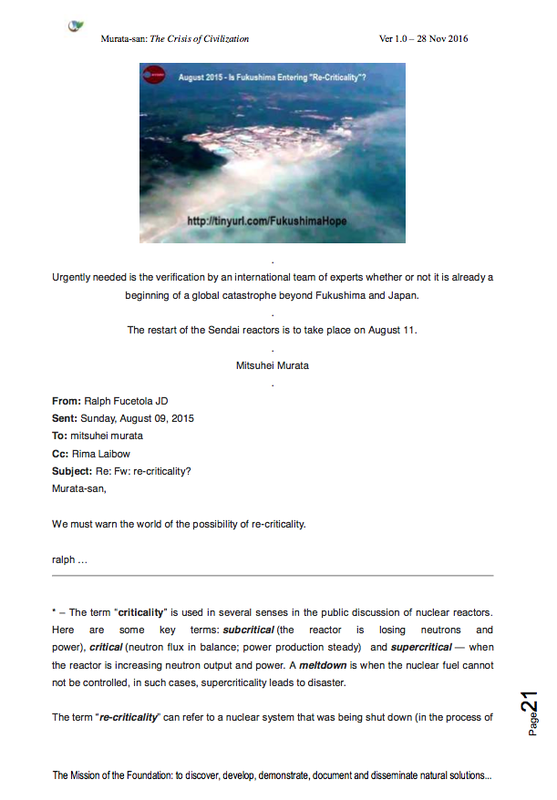 The restart of the Sendai reactors is to take place on August 11. .
￼￼￼￼￼￼￼￼￼￼￼* – The term “criticality” is used in several senses in the public discussion of nuclear reactors. Here are some key terms: subcritical (the reactor is losing neutrons and power), critical (neutron flux in balance; power production steady) and supercritical — when the reactor is increasing neutron output and power. A meltdown is when the nuclear fuel cannot not be controlled, in such cases, supercriticality leads to disaster. ￼becoming subcritical) failing to continue under control and instead, becoming “hotter” and less controlled. The term can also refer to a situation in which stored fuel rods become uncontrolled, such as through the loss of cooling water, and become critical again, or even supercritical, leading to a meltdown. These are what concerns Amb. 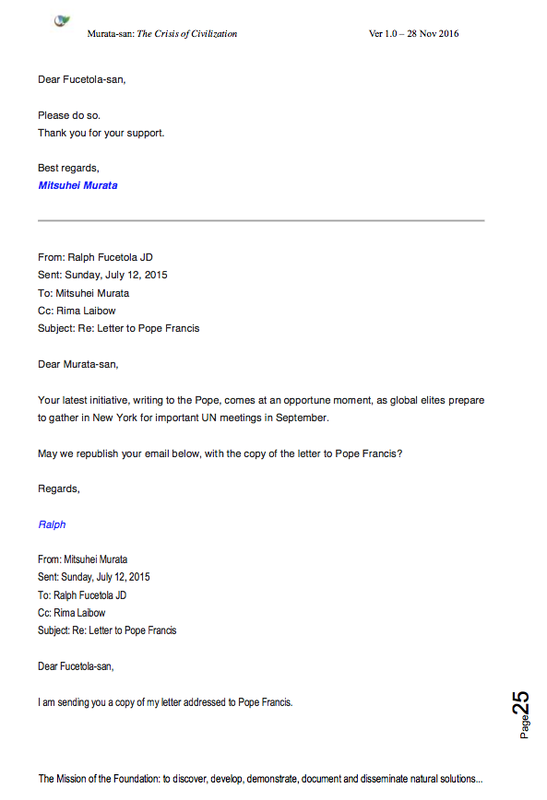 Murata in the email above. 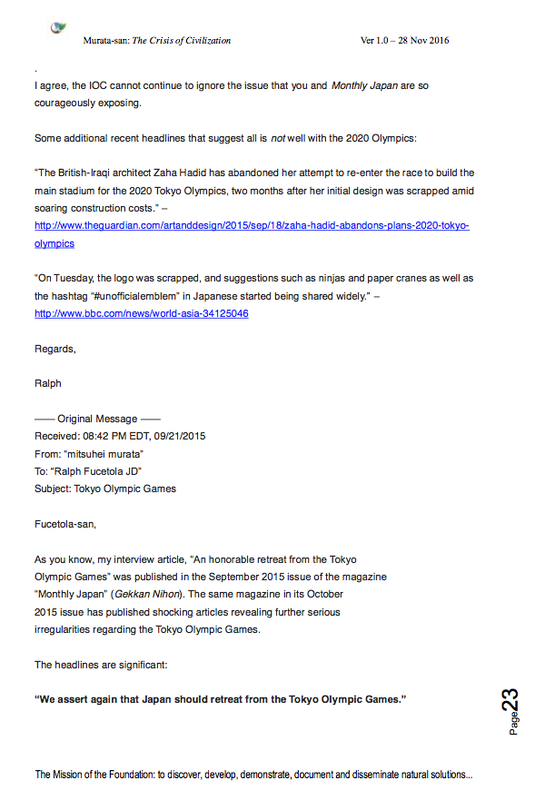 2015 issue has published shocking articles revealing further serious irregularities regarding the Tokyo Olympic Games. “This all started with the false assurance made by Prime Minister Abe !” said Creative Director Azusa Takano. I am convinced of the far reaching and decisive impact of these articles. 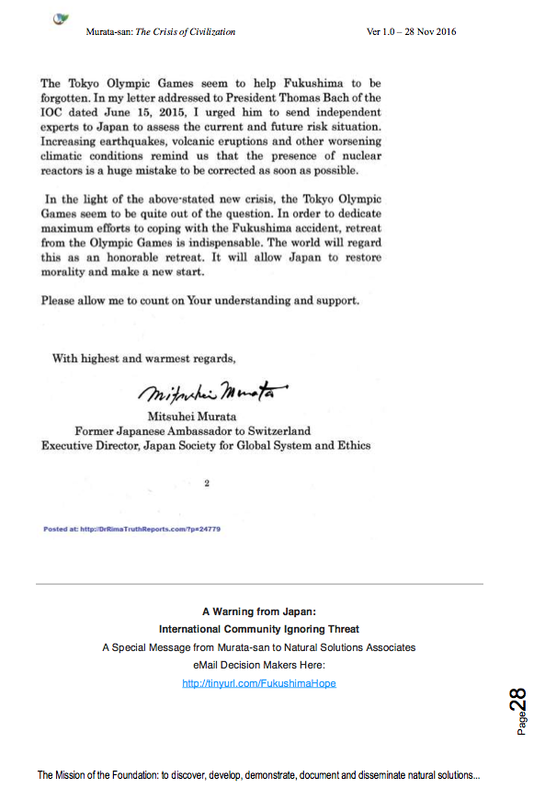 The IOC cannot much longer ignore the increasing demand to send neutral scientists to Japan in order to ensure the health and safety of Olympic athletes and visitors. ￼￼￼￼￼￼￼￼￼The initial commitments of the Tokyo Olympic Games have now all been broken. The IOC could disqualify Tokyo. ￼Japan is now obliged to choose between an honorable retreat and a shameful disqualification. ￼A decision is urgently needed. ￼The whole Japan was shaken by a big earthquake on May 30. ￼Daiichi were found to be leaking radioactive water. The leaking containers are at risk of possible hydrogen explosions, according to some experts. ￼Under such circumstances, it is more and more considered irresponsible and immoral to host the Tokyo Olympic Games, hiding all the relevant serious risks. 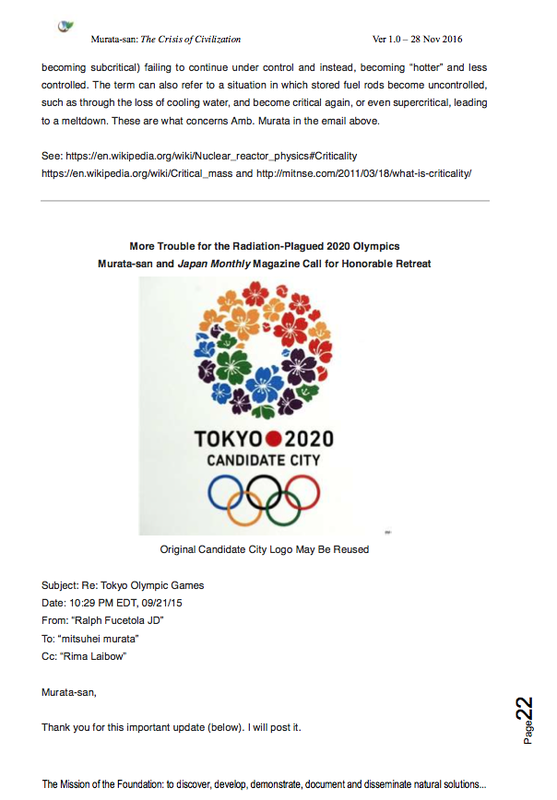 ￼Governor of Tokyo, Yoichi Masuzoe publicly blamed the Minister of Education and Science, Hirofumi Shimomura for not assuming full responsibility for the construction of the new Olympic Stadium. ￼IOC is now being questioned. We are reminded of the meaningful article of the “Economist” (28 February, 2015), severely criticizing the FIFA and the IOC. ￼The International Community can no longer remain indifferent to what is taking place to the molten fuel rods under the buildings of the Units 1, 2, 3. ￼in Japan results from a huge mistake. Another leakage at F-I was reported today. The initial commitments of the Tokyo Olympic Games are less and less kept. There will be no cover at the main stadium. Tokyo alone cannot offer necessary facilities,etc. The IOC has not responded to the totally legitimate request of Dr. Caldicotmade in January 2014 to reassure the safety by sending neutral scientists. The morality of the IOC is now being questioned. We are reminded of the article of the “Economist”(28 February,2015),severely criticizing FIFA and IOC. The International Community can no longer remain indifferent to what is taking place to the molten fuel rods under the buildings of the Units 1,2,3. The consequences are spreading worldwide, via the Pacific Ocean and the atmosphere(the increase of heat attack in California, England, Australia, Canada, Brazil). Recent earthquakes and volcanic eruptions are reminding us that the presence of nuclear reactors in Japan results from a huge mistake. ￼￼is far from it. 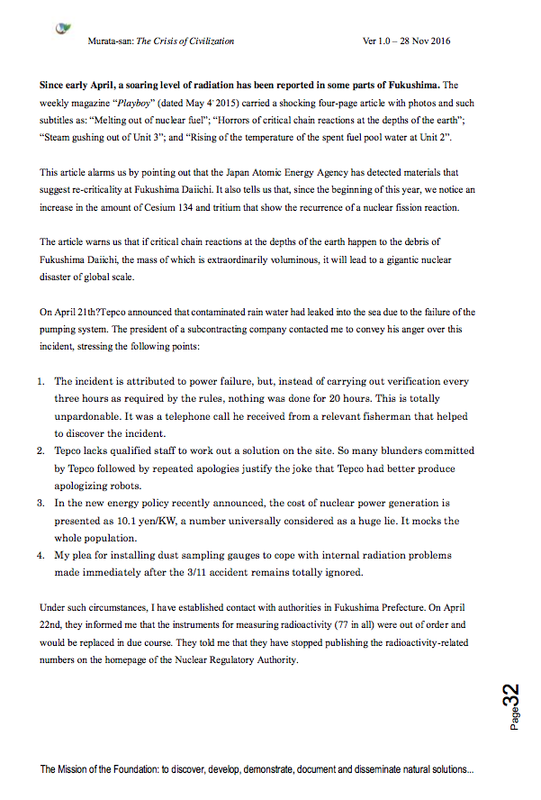 The following point of view of Dr. Norio Iriguchi, Professor Emeritus of Kumamoto University, impresses us with the potential horrors of the damaged nuclear plant. I wish to convey to you my impressions it has given me. The containment vessels of units 1, 2 and 3 are broken. The containment vessels were the last strongholds to shut radioactive materials in, but now they are now in contact with the external environment. The volume of each vessel is about 15,000 cubic meters. The temperature inside the vessels varies day and night, winter and summer, and we can presume they are breathing, so to speak, accordingly. Within the vessels, there are molten nuclear fuel rods. If the temperature rises for some reasons, radioactive materials are released into the atmosphere. Cesium 137 contained in the containment vessels of units 1, 2 and 3 is the equivalent of 14 thousand Hiroshima atomic bombs, 7000 of which are spent nuclear fuel rods whose radioactivity will be reduced by one to one thousand in 300 years. During this period, radioactive materials will continue to be scattered bit by bit as stated above, unless a major natural disaster takes place. 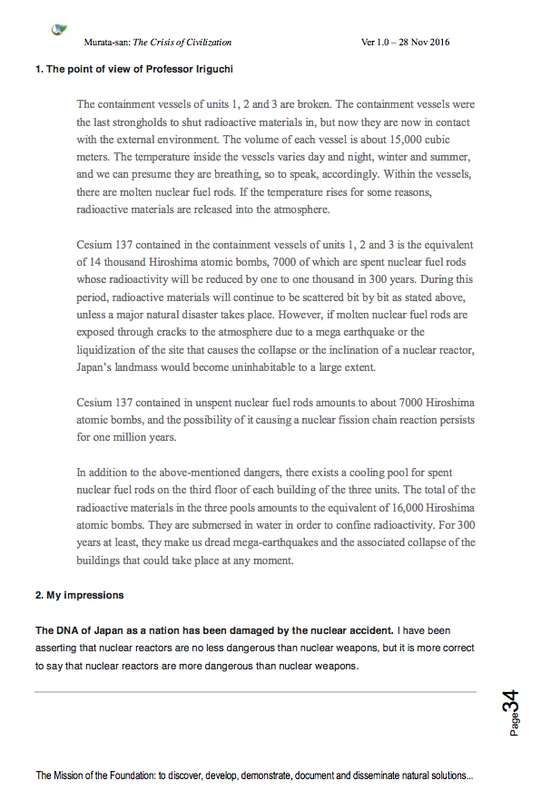 However, if molten nuclear fuel rods are exposed through cracks to the atmosphere due to a mega earthquake or the liquidization of the site that causes the collapse or the inclination of a nuclear reactor, Japan’s landmass would become uninhabitable to a large extent. Cesium 137 contained in unspent nuclear fuel rods amounts to about 7000 Hiroshima atomic bombs, and the possibility of it causing a nuclear fission chain reaction persists for one million years. In addition to the above-mentioned dangers, there exists a cooling pool for spent nuclear fuel rods on the third floor of each building of the three units. The total of the radioactive materials in the three pools amounts to the equivalent of 16,000 Hiroshima atomic bombs. They are submersed in water in order to confine radioactivity. For 300 years at least, they make us dread mega-earthquakes and the associated collapse of the buildings that could take place at any moment. ￼The DNA of Japan as a nation has been damaged by the nuclear accident. I have been asserting that nuclear reactors are no less dangerous than nuclear weapons, but it is more correct to say that nuclear reactors are more dangerous than nuclear weapons. ￼The nuclear accident has obliged many residents of Fukushima to abandon their native places. It has contaminated Japan’s invaluable soil with radioactivity and has brought about a situation that obliges the relevant residents to abandon forever their living and farming land. ￼The ongoing radioactive contamination of the sea with no prospect for a solution is dishonoring Japan, being criticized as harming the global environment. 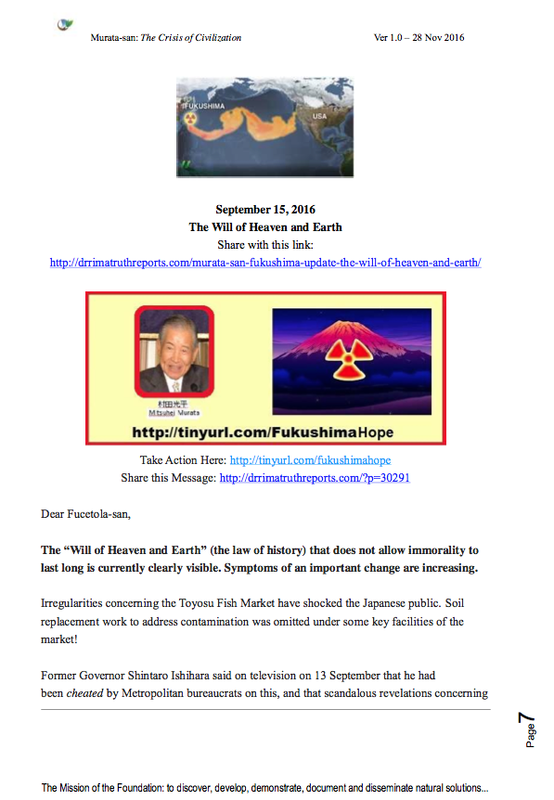 In spite of all this, attempts are shamefully being made to hide Fukushima. The Tokyo Olympic Games, the Senkaku Islands problem, the Takeshima issue, all these are just out of the question. ￼We salute Amb. Murata for being a Truth Speaker. 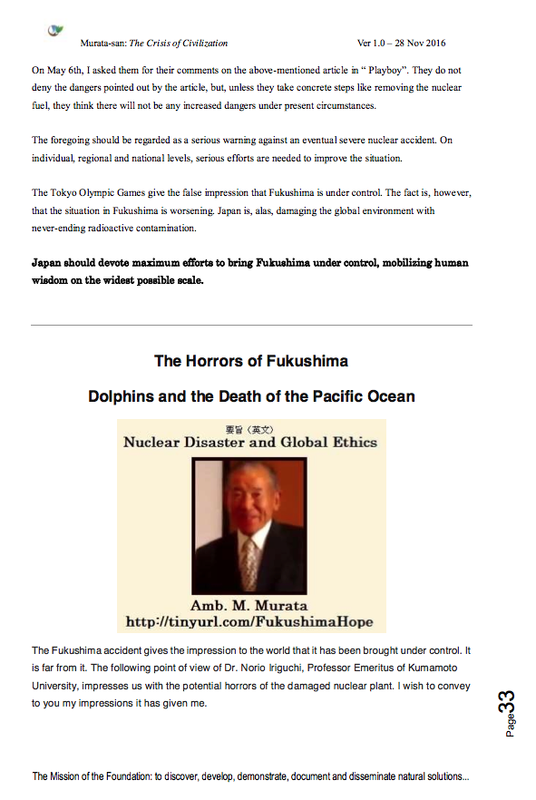 With the North American Pacific Fisheries being “closed” by government authority*; with the horrific die-offs of Pacific fish and aquatic mammals, such as the Dolphins, we are seeing the Horrors of Fukushima spreading across the world. It is not just the DNA of the people of Japan that is at risk, as Murata-san notes, it is the genetic integrity of all peoples and species at risk. ￼Dr. Rima has termed this condition “Genomic Disruption Syndrome” and the toxic impact of nuclear disasters is just one of its causes.